Susceptibility to Inter granular Corrosion (IGC ) of austenitic stainless steel can be determined by ASTM A262, ISO3651-2 and IS10461 (Part 1 & 2 ) . ASTM A262 describes four different methods of IGC practices such as Practice A, B, C & E.
Inter granular corrosion (IGC) occurs as a result of chromium carbide precipitation along the grain boundary causing the depletion chromium at the grain boundary forming galvanic coupling between a narrow anodic zone at grain boundary and cathodic adjacent base metal which has high chromium. Practice A is a microscopic method for determining the susceptibility to IGC due to the precipitation of mainly chromium carbide M23C6 at grain boundary. This method is also used to evaluate the effectiveness of solution annealing heat treatment or delivered condition. It does not detect susceptibility associated with precipitation of sigma phase. It is considered as Screening method of Practice B, C & E. Specimen accepted by Practice A may not be required for further inter granular corrosion test. For low carbon grade, sensitizing treatment at 6500-6750C for 1hour is recommended. It is expected maximum carbide precipitation may occur at this temperature range. 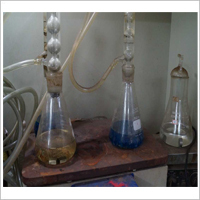 Practice B : It is Ferric sulphate –Sulphuric acid test for 120hrs boiling in the 50% solution. It detects susceptibility to inter granular attack with mainly M23C6 precipitated at grain boundary in a stabilized austenitic stainless steel. It cannot detect the susceptibility to inter granular corrosion associated with Sigma phase. It cannot detect also the effectiveness of solution heat treatment or the supplied condition of the material. It measures the weight loss after boiling for 120hrs. The result is expressed in mpy or mmy. Practice C : It is Nitric aicd test for 240hrs boiling to detect susceptibility to inter granular attack associated with sigma phase precipitation in Mo bearing or stabilized grade or Cr23C6 precipitation in stainless steel. . It cannot detect the effectiveness of solution heat treatment or the supplied condition of the material. It measures the weight loss after boiling for 240hrs. The result is expressed in mpy or mmy. Practice E : It is Cu –CuSO4 -16% H2SO4 that detects the susceptibility to precipitation of chromium rich precipitates mainly Cr23C6 carbides. It can detect the effectiveness of solution heat treatment or the supplied condition of the material. It is also used to determine effectiveness of stabilizing element such as Ti and Nb.